Chapter 11 of Mask Maker has been posted, and that's all folks! It's a pretty bittersweet ending...not just for the story, but also for myself, since this is actually the largest piece of Bionicle fanfiction I've completed, and it'll likely be the last (for a good long while at least). As a final act in 2016, I've posted an epic entitled Mask Maker. It's a final take on the Bionicle G1 storyline that has been taking shape for a few years now. Here's the main topic and the review topic if you're interested in reading and/or commenting. It'll also be on my tumblr blog. See ya '16. I wanted to do one final Matoran Language translation for the year, and what better text to translate than "Auld Lang Syne"? In fact, the theme of the song feels doubly appropriate for the Bionicle fandom this year, with the final closure of the original line and the exciting rise of the new generation of sets and story. With that in mind, I decided to translate the titular Scots refrain Auld Lang Syne "Days of Long Ago" using the familiar Matoran phrase Ivaha Vahai "In the Time Before Time". May it always be remembered. If you’re someone who remembers BZPower back before the archive deletion and downtimes (I confess, I’m getting murky) and roughly prior to '08-'09, you might know me as a different person. I mostly lurked 'round this little forum called Artwork II, which was the place where all the shops and "sprite kits" were safely hidden from the world. Back then, most of my contribution to BZP came in the form of pixel art. Yeah, it was a different time. 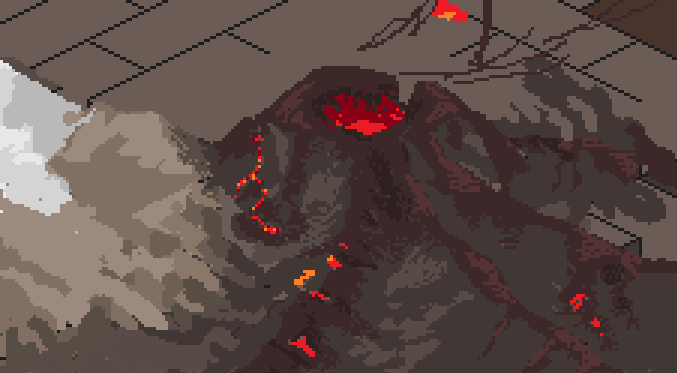 Well, I haven’t done any pixel art for quite a while—nothing worth posting, at least. Even so, I get the hankering every now and then. And in fact, for a long time I’ve been wanting to start something long-term: a project to fiddle with in my spare time. Pixel art is quite cathartic, I find, and it’s actually a great stress-reliever. Go figure. The project is a roughly to-scale isometric map of the island of Mata Nui; 1 pixel = ~.25 kio (these images are at about x3 magnification). 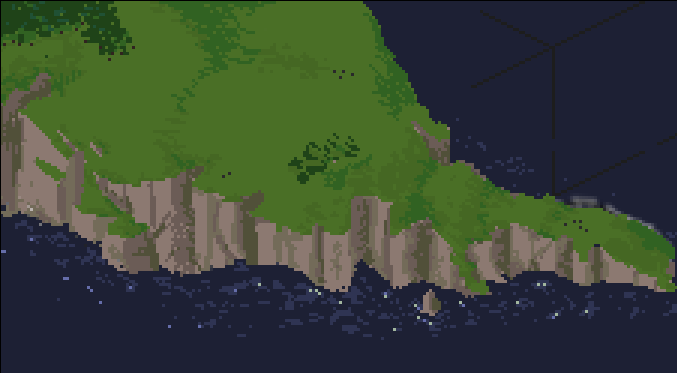 I find landscapes to be very enjoyable to do, and isometric pixeling suits that pretty well. The images above should be kinda familiar: the Mangai Volcano and the southern tip of the island coast. This is only a few hours’ work, so it’s absurdly rough, but you should get the general idea. You people have brought many a smile to my face the past few days. After the time invested in the Matoran Dictionary project over the last several years, the sudden boost in exposure and overall positive response—both on BZP (thx news!) and off—means a lot. I’m glad to see so many people delving into it and having fun. In the end, that was the impetus for this project: my own personal enjoyment and enjoyment for other members of the Bionicle fandom. It’s all very satisfying. Heartfelt thanks. Changes are coming for me. They are almost upon me...What are these changes? They are real life changes. Mostly the fact that, as of next week, I'll be starting training for a new teaching job at my university. Also, as of the end of August, I'll be starting the first semester of my Ph.D. These are big changes. I'm excited. Unfortunately, these changes also mean that I will no longer have this thing so ironically termed "free time". I generally think "I'm leaving BZP" announcements are silly, so let me be clear that I'm not leaving BZP, silly. I expect I'll be around till the bitter end, be it by fire, or water, or gigantic aquatic moons to the cranium, or the slow dwindling of age. I'll be around, but for the foreseeable future, I'll be entering a deeper level of lurk than usual (if that's possible? ), so that's one thing that will change. But enough of that. You might notice the title of this entry. It has nothing at all to do with my online activity. Actually, it refers to the status of what is perhaps the biggest project I've ever undertaken on BZP: A Matoran Dictionary. It's finished. Or, at least, it's as finished as it'll ever be, which is pretty darned close to finished, if I do say so. What does that mean? It means that, as of now, the Matoran Dictionary contains an entry and an etymology (sometimes multiple etymologies) for every Bionicle name/term that can reliably be considered Matoran in origin. By my estimate, that's close to 85-90% of all Bionicle names/terms in existence. This includes every official "canon" name/term (Tahu, Kopaka, etc...all the way down to the awfulness of Vultraz), as well as technically non-canon names from various media (including the numerous Matoran names scattered throughout MNOG and MNOGII). The total number of entries, you ask? By my count, about 832. Of those 832 entries, roughly 48% are full Bionicle names/terms (e.g., tahu, kopaka, etc.) while another 45% are authentic subcomponents of those names/terms (e.g., ta "elemental fire", huw "activity"; ko "elemental ice", paka "strength", etc.). The remaining ~7% are "new" terms that I have fabricated out of those subcomponents (e.g., gamadu "jungle tree", from ga "elemental water" and madu "tree"). In total,the dictionary has expanded to three volumes, which I will be posting in succession relatively soon. Yay. This has been a massive undertaking, and I've probably spent more brainpower on it than is healthy over the past seven or eight years, but even so, it's nice to be able to sit back and say "There. It's done. Whew." For those of you who have been interested, thank you for your interest. I hope you enjoy it as much as I did. 1. Write for the FFM - There's a Bionicle category and an Off Topic Culture category every other day. That means there's something for Bionicle fan-fiction writers and for normal people too! (=P) By entering, you support writing on BZP, and you might just win something for it. 3. Vote in the polls - This is probably the most important thing to emphasize. It's no fun when a story wins by a single vote out of four votes total. That's just statistics. No one likes statistics. Well, not in a writing contest, at least. Statistics is pretty cool...But I digress. Now go forth, and be awesome. After four relatively large entries crammed with information on the Matoran language, it strikes me that I still have enough of this stuff to go on for quite a long time. It’s exhausting (yet somehow rewarding) to put these things together, and I hope someone out there derives as much enjoyment from the topic of Matoran linguistics as I have. With this in mind, I’m considering making this an actual regular thing, possibly weekly or twice-weekly, with smaller, more focused amounts of information per entry, rather than the info-dumps I’ve been doing. Already I know that I have enough content for at least another ten to twelve short(er) entries, possibly twice that, depending on how things are paced. It sounds like a lot. . .but there are a lot of words in Bionicle. But beyond that, the reason for this interim entry is actually to ask something of you. Yes, you--the reader. I see you there, lurking. Answer me this: What do you think? Are you burnt out yet? I know I’m not, but we’ll see. Do you enjoy these entries? It’s not often that I ask for comments, mostly because I know some people may read, but don’t have much to respond beyond “I (don’t) like X”. That’s the nature of the topic, of course, but even so, I’d certainly like to know. Sometimes I imagine I’m talking to myself. It’s good practice, I suppose. Talking. . .
I’d also like to ask if you, the reader, have any “requests”. Are there any particular Matoran words/names/whatevers that you’d like to see translated? If so, feel free to leave a comment, and I’ll attempt to incorporate any requests into future entries. Dual Matrix's Ultimate Guide to Matoran, by Dual Matrix -- topic still living as of April 7. I don’t frequent S&T much anymore, but if I did. . .I suppose I would've been more informed. As it is, I only discovered the existence of these topics last week. There are a lot of great and creative ideas here, so take a look! One distinction between the approach to the Matoran language exhibited in these topics and the approach I’ve taken here has to do with “canonicity”: as realistic visions of the Matoran language, these topics attempt to translate words within the fairly strict guidelines of the canon Bionicle storyline. In contrast, in this blog I have been very free in my translations, decomposing words into smaller and smaller units, affected by regular (but completely invented) phonological processes, and heavily paraphrasing “canon” translations in order to derive consistent meanings across words and morphemes that, on the surface, might seem drastically removed from each other (much as is the case in human language). For that reason, posting any of this as an official “theory” was, unfortunately, never really an option. But that’s okay. I applaud the efforts of those represented in the topics above and encourage you to peruse them for your own personal fulfillment (or amusement). It’s fun stuff. Terribly fun, you have to admit. . .And I think I’ll end it on that note. I look forward to your (possible) replies. ...AND the one it needs right now. "Not a nasty, dirty, wet hole, filled with the ends of worms and an oozy smell, nor yet a dry, bare, sandy hole with nothing in it to sit down on or to eat: it was a blog-hole, and that means comfort." A Short Bio of the...Author?